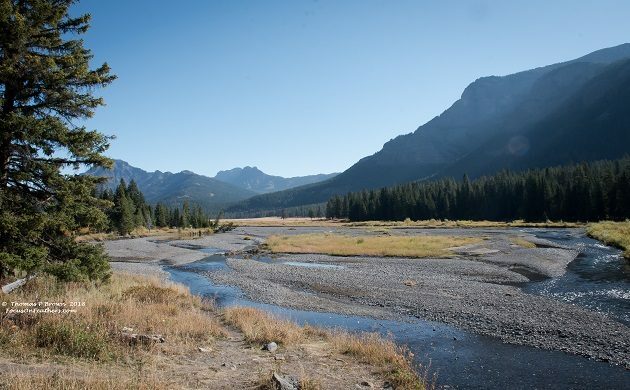 Last week we were in the Teton Valley, getting ready to head over to Wyoming, and Yellowstone National Park. Things were getting much colder, and the threat of snowfall was looming. Snow is not something I want to deal with when pulling a 30 foot 5th wheel, so we were planning to make like our many feathered friends, and migrate south to much warmer climes! As it turns out, many of those very birds that I had hoped to find, all had the same idea, and had moved out of the park as well. In talking to the local guides, and Rangers, they all agreed that they had not been seeing too many species around in the last couple of weeks. Crows, Ravens, Clark’s Nutcrackers, White-crowned Sparrows and assorted waterfowl were all still present, but that was about it. Of course, there were plenty of big game around, and so I will post a few of those shots at the end of this posting. 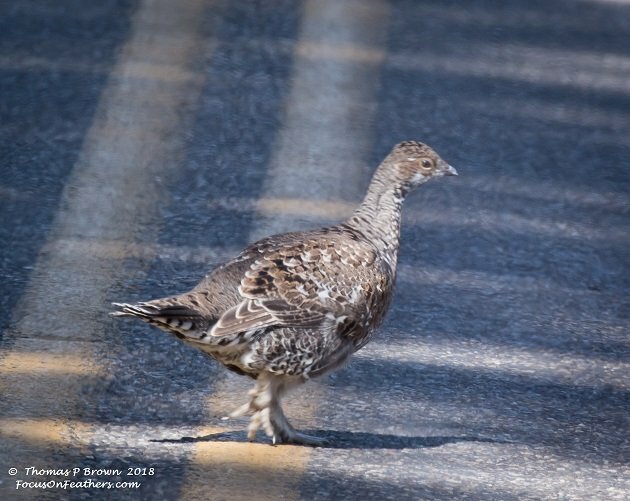 One big surprise was a new Lifer in the form of a Dusky Grouse, which walked across the road in front of me. I guess I will take them where ever I can get ‘em. Here is that quite cooperative Dusky Grouse but I had to shoot the picture thru the front windshield. 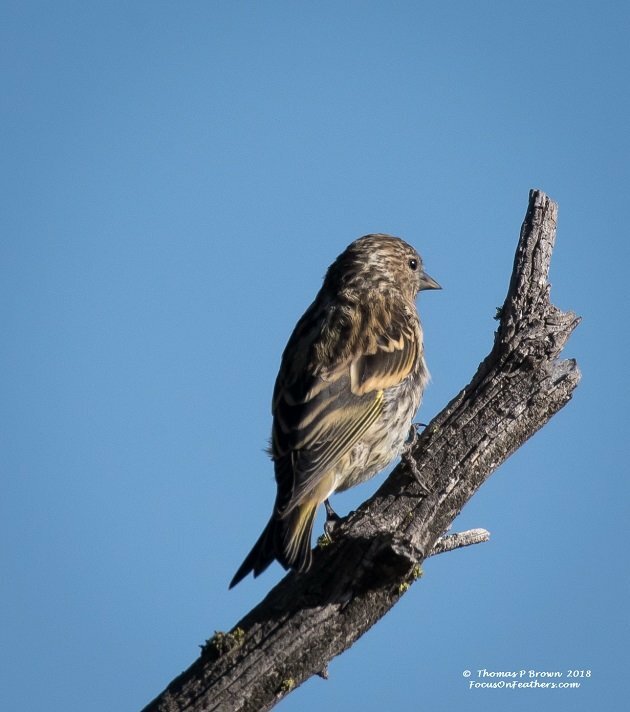 We had stopped at one of the massive over-looks near Roosevelt Lodge, when a small group of Pine Siskins flew all the way across the canyon, and landed in the tree above me. 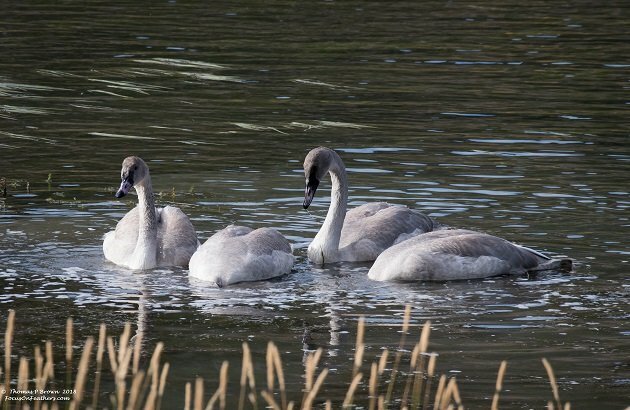 Yellowstone NP is somewhat famous for its Trumpeter Swans. 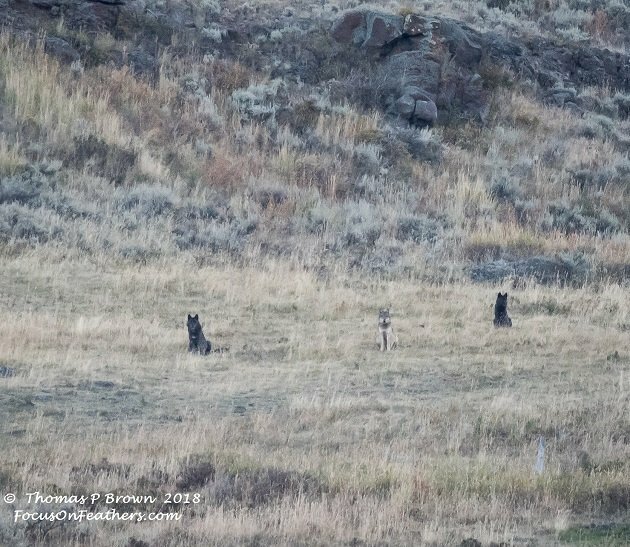 I was never able to stop anywhere to get photos of the adults, but these four Juveniles were happy to be photographed, just not all at once. There is a large area of road construction between Mammoth Hotsprings, and the West Yellowstone entrance. 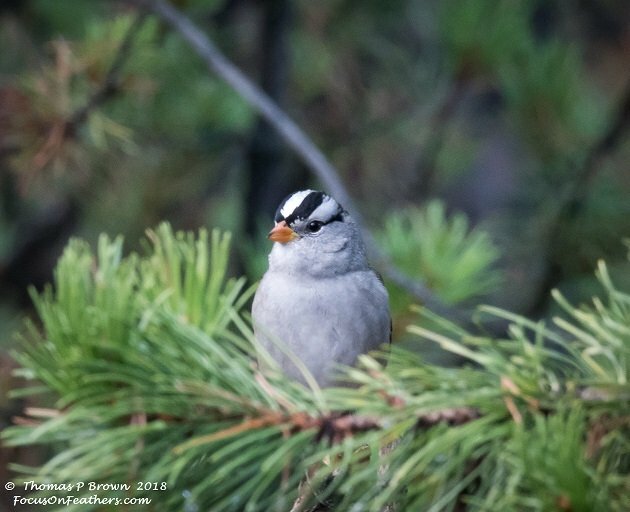 This can cause up to 20 minute waits, which I put to good use, tracking down this nice shot of a White-crowned Sparrow. 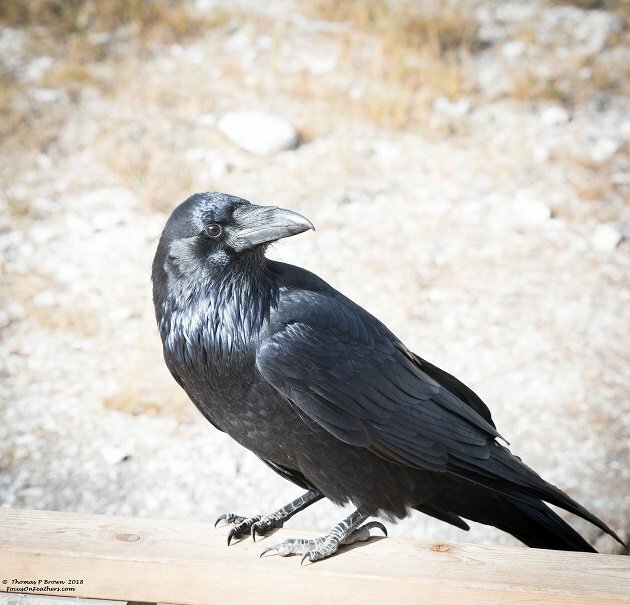 I would have to say the most common bird in the park, must be the Common Raven. We were waiting for Old Faithful to do its thing when I took this picture of a Raven, working the crowd for snacks. Just as a bit of a side note, during our wait, one “Idiot” decided to walk out into the incredibly sensitive area that surrounds the opening to Old Faithful. He even to the time to lay down and look in the hole! I have to admit, there was more than one person in the crowd, hoping for an early eruption. I somehow managed to make it on a video taken by someone in the crowd, which made it on several social media sites, including Facebook. You can see me walk thru the picture a couple of time when I was with the ranger trying to get the guy to come back to the board walk. There is a link from my Facebook page here. After leaving Yellowstone NP, we drove to Cody, Wyoming wanting to visit the Cody Western Museum, as well as hit a couple of bird sites. We walked along the Shoshone River, visited Benton Lakes, the Glasco Mining area ponds, and the Alkali Lakes. The first three yielded the same old birds, Yellow-rumped warblers, American Robins, Northern Flickers, Mallards, Pied-bill Grebes, Mourning Doves and House Sparrows. 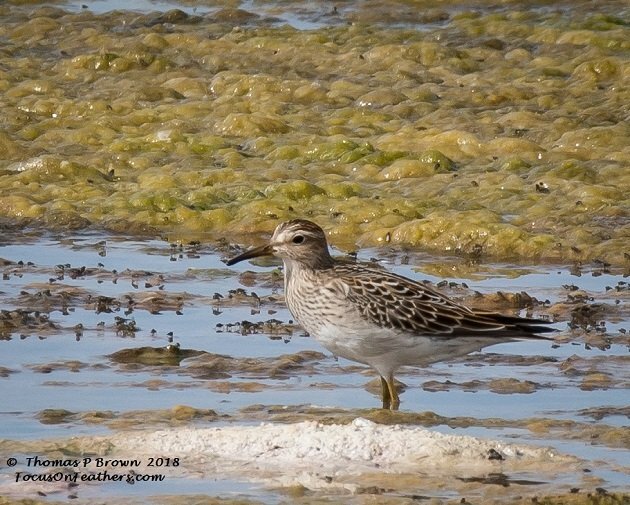 The Alkali Lakes was a different matter, with a good bunch of birds, including Ring-bill Gulls, Mallards, Blue-wing Teal, green-wing Teal, Killdeer, Baird’s Sandpipers, red-wing Blackbirds, Osprey, Trumpeter Swans and Canada Geese. The surprise addition to that list was a pair of Pectoral Sandpipers. 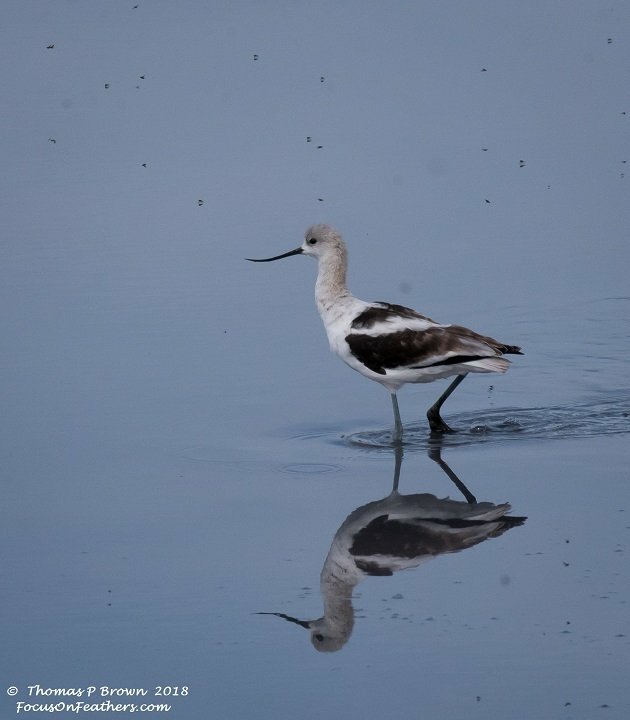 There was also a single American Avocet gleaning a few bugs off the south end of the pond. Our last night in Wyoming was spent at the historic Terry Bison Ranch. We picked this as much for the location as its chance for some decent birds. The location was super, and while there was nothing new, there was a nice group of birds. 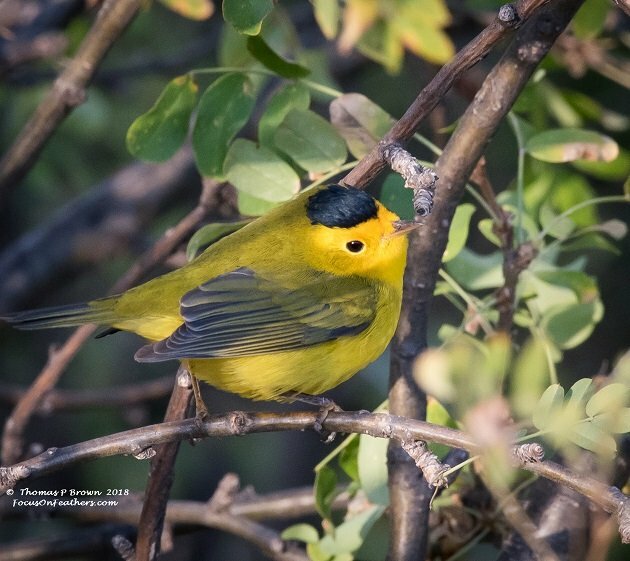 This male Wilson’s Warbler was one of nearly a dozen that were in the hedge next to our RV. 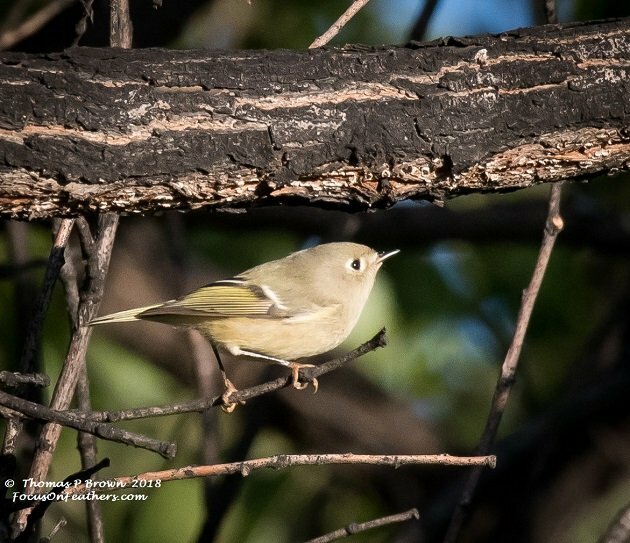 The near by trees had several Ruby-crowned kinglets. 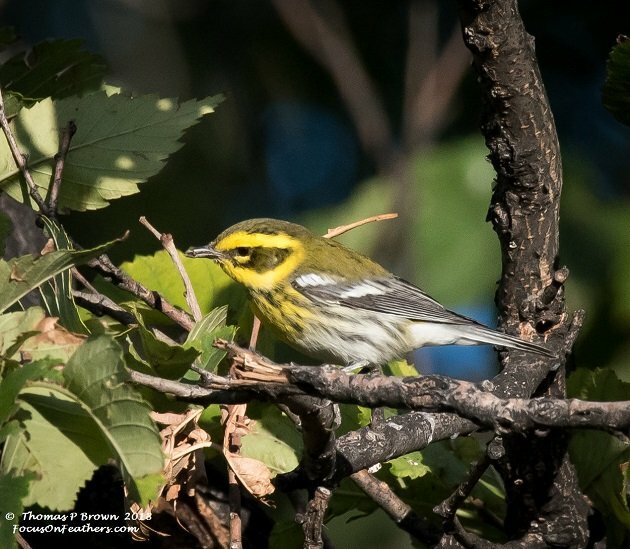 Down near the original cook shack was a bush that held one Townsend’s Warbler. 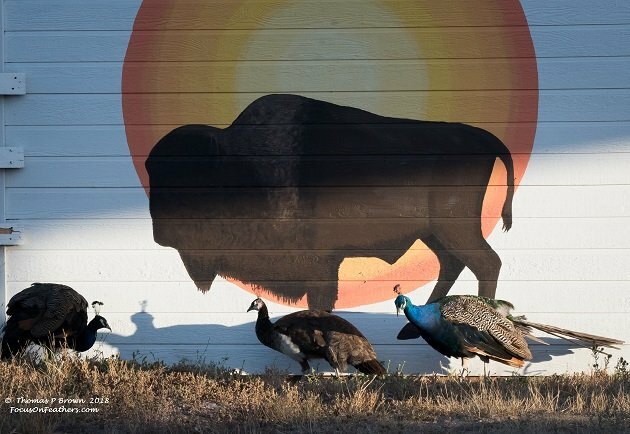 Where else but in Wyoming will you find Peacocks and a Buffalo together? OK, I know it is cheesy, but the picture just caught my eye! 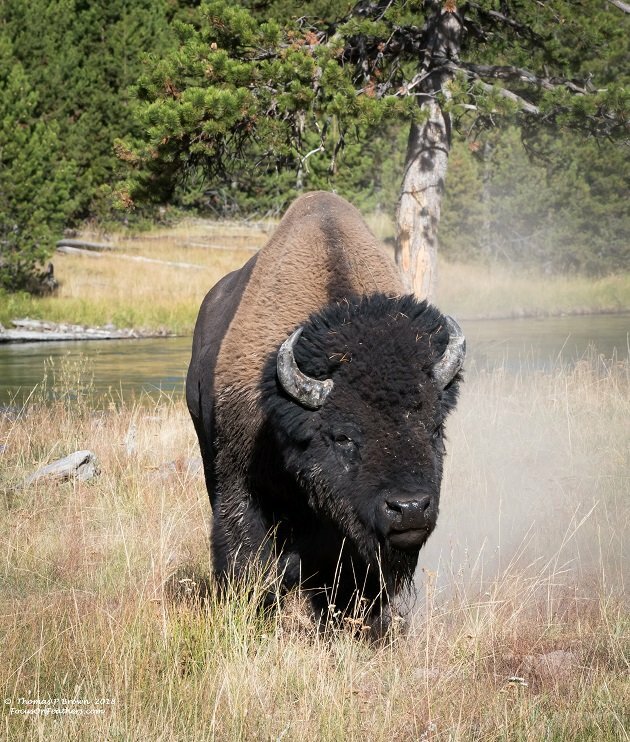 Whenever one thinks about Yellowstone, the first though for the majority of folks is probably the animals. You know, the Bison, Elk, Bears and Wolves. We did not ever see a Grizzly Bear, but we did see a Black Bear, although it was way too far away for a picture. The Rocky Mountain Goats were the same thing, saw them, got a shot, but from 800 yards away, it really isn’t much to write home about. Here are the rest of the animals that we did see. Of course there were literally hundreds of Bison. 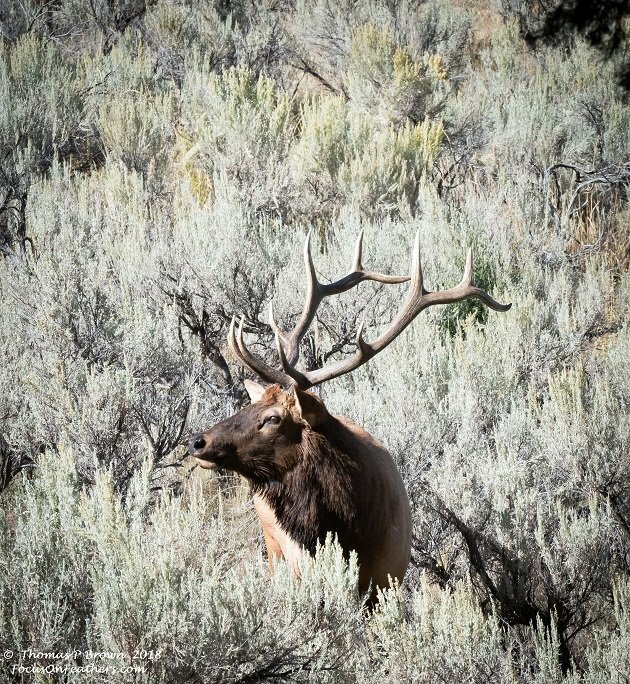 We had Elk right in our camp with us every day. 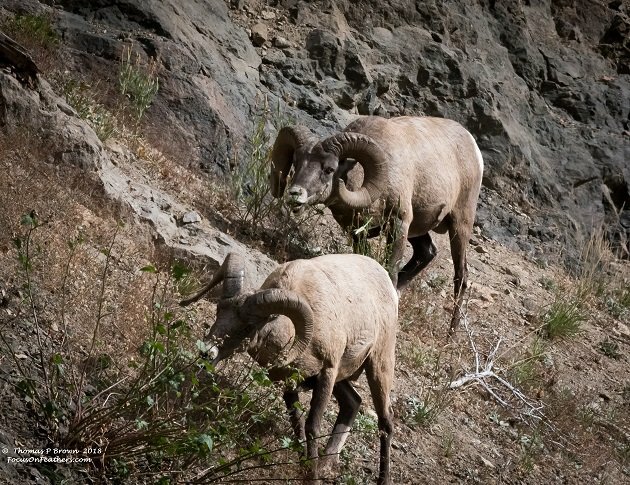 The hardest image to get is always the Bighorn Sheep, so I am pretty happy with this shot! 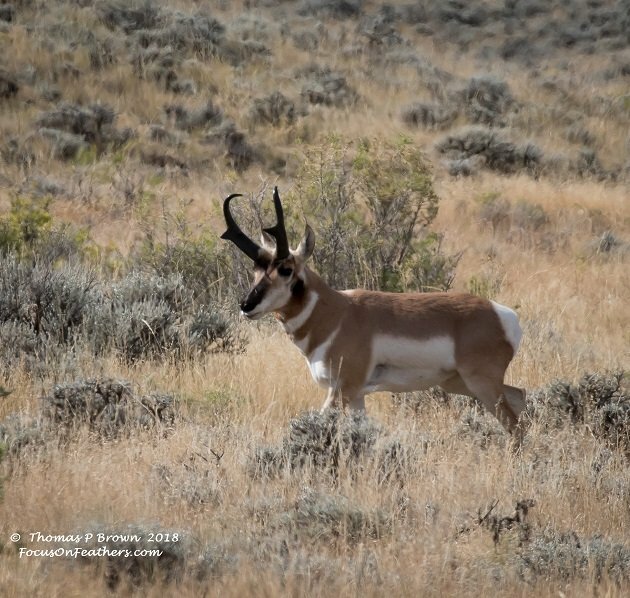 Pronghorn Antelope are about as common as Jackrabbits throughout Wyoming, but this guy walked right by me one morning. 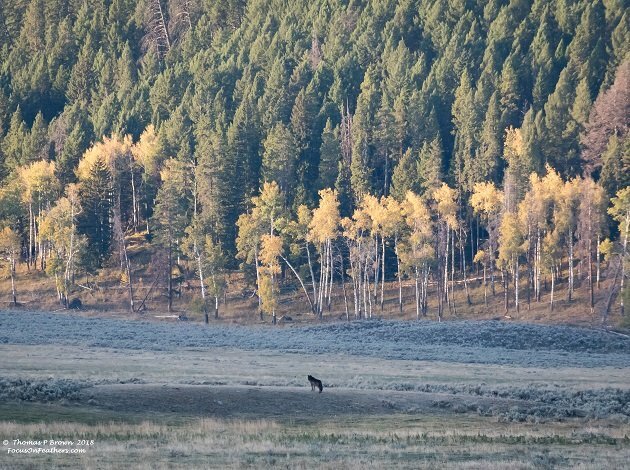 One of the black wolves crossed the road and gave me what I consider to be an iconic Yellowstone NP photo, sitting on a rise, with the aspen trees just starting to turn. 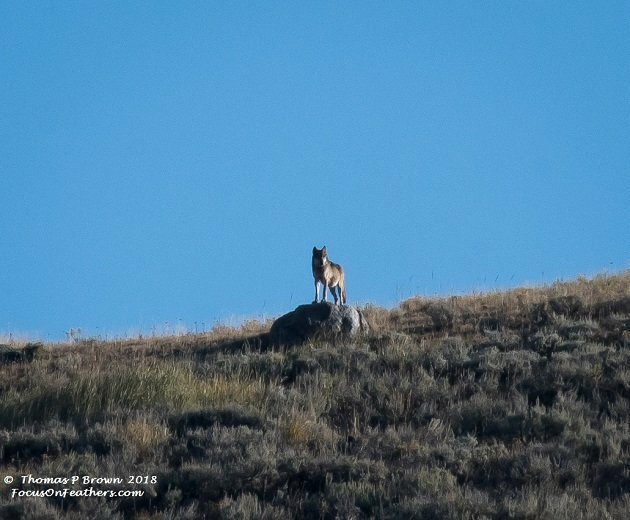 Then, just as we were getting ready to leave, the gray wolf that had been on the ridge all morning, calling to the rest of the pack climbed up on a sentinel rock for my last photo in Yellowstone National Park. 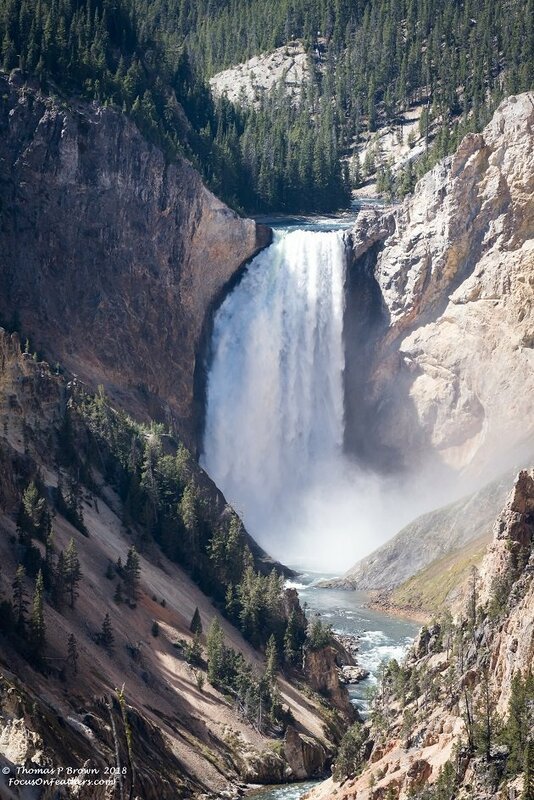 I end this story, with an early morning photo of Yellowstone Falls, taken right as sunrise, from Artists Point. We are on our way to Colorado, and the famous Trinidad Lake area. This will be our only stop in Colorado, as we need to get south so I can find some of the south west desert birds before my time runs out.